For years, children and adults have stuffed their candid dreams, wishes, and promises into envelopes addressed to Santa Claus. Whether the envelopes come with stamps or without, are addressed to “The Big Red Guy at Jingle Bells Lane” or simply “To Santa,” for over 100 years, millions of these letters have poured into Santa Claus, Indiana. Arriving from all corners of the globe, the letters ask for toys, family reunions, snow, and help for the needy―sometimes the needy being the writers themselves. They are candid, heartfelt, and often blunt. Many children wonder how Santa gets into their chimneyless homes. One child reminds Santa that she has not hit her brothers over 1,350 times that year, and another respectfully requests two million dollars in “cold cash.” One child hopes to make his life better with a time machine, an adult woman asks for a man, and one miscreant actually threatens Santa’s reindeer! 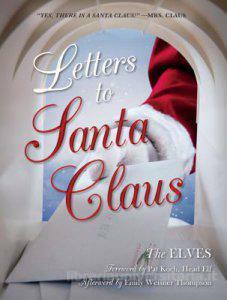 Containing more than 250 actual letters and envelopes from the naughty and nice reaching back to the 1930s, this moving book will touch readers’ hearts and bring back memories of a time in our lives when the man with a white beard and a red suit held out the hope that our wishes might come true.